Unfortunately, we don’t live in the wilderness. We are lucky, however, that our yard links up with some large fields and the remnants of old family farms to form a green corridor rich enough to support foxes, wild turkey, woodchucks, rabbits, coyotes, and, as we discovered this spring when our apple trees were nearly chewed to bits, deer. Except for the deer, who were not welcomed by Sean the apple farmer, we are happy to be able to hear the occasional yipping fox late at night, and to watch the rabbits hopping around when we go for walks in local conservation lands. We’ve tried to encourage most wildlife in the yard, and have hung birdfeeders, beehouses and bat boxes to encourage natural pollinators and help the migrators along their routes. 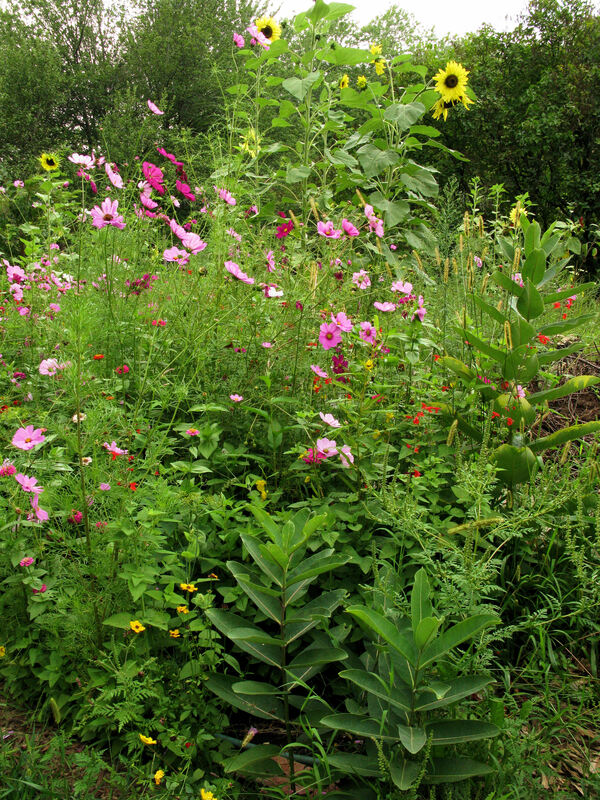 This year we knew we’d be pressed for time to tend to the extensive vegetable gardens we usually grow, so we decided to turn one of our large garden spaces into a wildflower garden that could help support the local bee/bird/butterfly population. All summer, the garden has been alive with activity. I’ve seen hummingbirds sparring over choice blossoms, goldfinches going crazy on the coreopsis seedheads, and bees and butterflies flitting about by the dozens. The sunflowers will provide seeds for the birds to eat come autumn, and to re-seed the garden for next year’s crops, and the milkweeds will provide a valuable food source for several life stages of Monarch Butterflies. This 200 foot square piece of yard has literally been buzzing all summer, and we’ve been thrilled to watch the tiny insect dramas playing out among the plants. While Liam is too little to fully appreciate the garden right now, as he grows I imagine we’ll spend time learning about the butterfly life cycle as we watch it play out in front of us, track bees across the yard and talk about the physics of hummingbird flight. Unless otherwise noted, all content ©2011-2016 Allison Donohue-All Rights Reserved.